Click & Grow says its new indoor farming solution can grow enough fresh produce for an entire family. Update, August 13, 2015:Click & Grown recently changed the name of this product from the Smart Mini Farm to the Robot Garden. This story has been updated to reflect that. If Click & Grow has its way, we’ll all be growing our own food in the not-so-distant future. The Estonian startup hopes to accomplish this through products like the Robot Garden, an idiot-proof indoor farming system it announced today. The Robot Garden is not a completely new class of product for the company, but a smaller and much more affordable alternative to the Smart Farm system it announced back in April. At $300, it only costs a fifth of the latter’s starting price. It’s an indoor farming solution designed to allow even the most clueless urban sodbuster to grow fruits, herbs and vegetables with negligible effort. The list of supported plants includes, but is not limited to, kale, salad, tomatoes, chili peppers, strawberries, and peppermint. 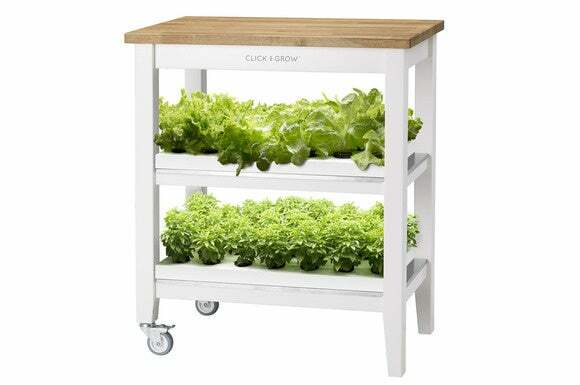 The kitchen cart-like Robot Garden comprises two trays that can accommodate up to 30 plants each. While hydroponics and aeroponics (both soil-less gardening techniques) are gaining ground among vertical farmers, the Robot Garden bucks that trend by using a spongey soil-based medium. And that is a good thing because those other solutions can be quite expensive to set up. The company’s propriety Smart Soil growth medium can help plants grow 30 percent faster and with 95 percent less water than what’s possible with traditional farming techniques. The system also includes “ultra-efficient” LED lights, electronic precision irrigation (EPI), and a mobile app. Why this matters: The rapid increase in urbanization around the world is a serious concern from a food-security standpoint. It is widely believed the answer to our growing food distribution and supply problems lies in urban agriculture, which as we all know is still in its infancy. That could change pretty quickly with the arrival of idiot-proof, relatively inexpensive products such as this one. Founded in 2009 by Mattias Lepp, Click & Growth has grown by leaps and bounds. The company—which has the backing of Skype founder Jaan Tallinn—first shot to international attention in 2013 when it was able to raise more than $625,000 on Kickstarter for the development of a smart pot. The firm has received more than 2,000 pre-orders for its much-larger Smart Farm automated farming system over the past two months. Today, the venture fund Y Combinator announced that it would be making an investment in the company. Y Combinator has previously backed Airbnb, Dropbox, and Reddit, amongst other startups.